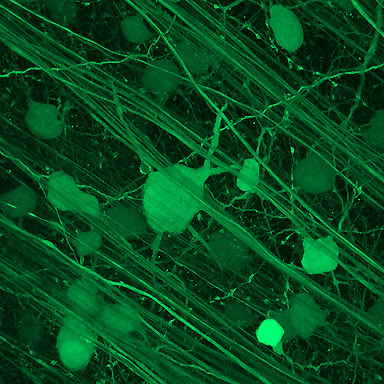 Rat retinal ganglion cells labeled with non-replicating virus (AAV2) carrying the reporter gene green fluorescent protein (GFP). This image was generated by Mary Ellen Pease, MS using the Microscopy and Imaging Core Facility at the Wilmer Eye Institute at Johns Hopkins School of Medicine. This work was carried out in Dr. Harry Quigley's lab, which studies the pathogenesis of glaucoma. Glaucoma, the second leading cause of blindness worldwide, is a disease in which retinal ganglion cells (RGCs) die. Our laboratory studies the biochemical and pathological changes that are associated with the onset of glaucoma. Much of our work is carried out in rodent models in which we can artificially induce high intraocular pressure (IOP), the risk factor that is most commonly associated with glaucomatous progression. In this project, a non-replicating virus (AAV2) carrying the gene for brain-derived neurotrophic factor (BDNF) or the reporter gene, green fluorescent protein (GFP) was injected into the vitreous of a series of rat eyes. Two weeks later, glaucoma was induced by laser treatment to the same eye to elevate IOP. Four weeks later the tissues were harvested and the number of surviving RGCs was quantified. More RGCs survived in the BDNF treated group compared to the GFP (control virus) treated eyes, suggesting that BDNF provided protection against glaucoma damage. This specific image was taken from a pilot study in which AAV2/GFP was injected in an otherwise untreated eyes to evaluate the efficiency of the virus. Using the ZEISS LSM Meta 510, a Z stack was performed in single track mode with the 488nm argon laser to generate a single projection. This technique allows us to track cell processes that would otherwise be out of the plane of focus at this magnification using conventional fluorescence microscopy.